Have you set goals for your future? A goal is the result or achievement toward which effort is directed. Goals can be short or long-term, personal, professional, spiritual or physical, and are usually specific to a person or group. According to Dr. Gail Matthews, a psychology professor at Dominican University in California, you are 42 percent more likely to reach a goal by writing it down. In short, a goal that is not written down is just a thought. On my first and second deployments I had no strategy for setting goals. For my third deployment, I bought a journal and wrote down my goals and plans to make them a reality. As a result, I completed three online college courses and earned two Community College of the Air Force degrees. I also completed several hours of professional development, became debt free and most importantly, effectively managed my time. I achieved more on my third deployment than my first two combined. When setting goals, you must make sure they are specific, measurable, attainable, realistic and timely, or S.M.A.R.T. A specific goal has a greater chance of being accomplished and allows for strategic planning. A measurable goal establishes concrete criteria for measuring progress toward the attainment of each goal set. You should set milestones to track progress and make corrections as needed. To ensure goals are attainable, you must figure out the best route to take to achieve your goals. The Professional Development Guide describes this as the planning phase. You are the best person to determine if a goal is realistic based on your abilities. For instance, a goal of losing 50 pounds in 30 days is not realistic. To ensure your goal is timely, have a reasonable completion date and adhere to the checkpoints set. If these steps are skipped, you will easily get off track. As the individual setting the goal, you should also make sure people who can assist in achievement know it. 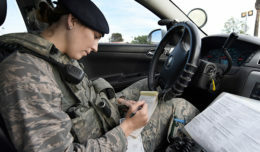 For example, if your goal is to make senior airman below the zone, it is probably a good idea to let your supervisor know your intentions. Making your goal known shows your motivation to live the core value of excellence. Can you really be “excellent in all you do,” if you do not set goals to become excellent? Also, setting and achieving goals gives you confidence to set greater milestones and achieve them. Setting goals is an important aspect of life that has been proven repeatedly. My current goal is to earn a bachelor’s degree in accounting. One of the milestones I set was the completion of four classes during this deployment. I am well on the way to accomplishing that milestone. Knowing my strengths and weaknesses has made accomplishing this easier. It is never too late in life or on a deployment to set goals. So, I pose the question, “How many of you have goals?” We all have to start somewhere. I will see you at the finish line.